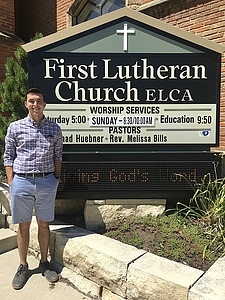 Liam organized a clean energy tour around Decorah and promoted clean energy with the help of local leaders, during his summer internship with Iowa Interfaith Power and Light in Decorah, Iowa. Two local congregations hosted tour stops where Fraser helped highlight their efficiency and clean energy investments. He also organized meetings with local energy leaders to discuss possible involvement in the project. Liam learned how unifying the topic of energy can be in a small community like Decorah. "Everyone relies on energy to go about their days, so determining ways to improve efficiency often brings people together…[t]his internship allowed me to become more comfortable reaching out to various community members and marketing an event to a specific target audience," he said. Upon graduation, Liam will look into working for organizations such as Iowa Interfaith Power and Light or the Winneshiek Energy District. He believes developing community clean energy should be a national priority. The experience he has gained has inspired him to consider applying for graduate school. 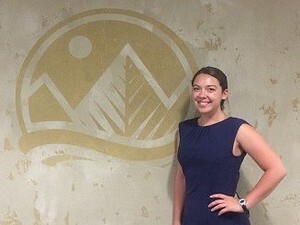 Where: The Wilderness Society, Washington, D.C.
Over the summer, Meghan interned at The Wilderness Society in Washington, D.C. She attended Congressional hearings and learned about public land policies. One issue she worked on included the maintenance of national parks. This was interesting to Meghan because, the year prior, she had spent the summer of Glacier Bay National Park in Alaska. She had seen firsthand the impacts of this issue. Being able to examine environmental policies during both experiences helped Meghan understand them better. Washington, D.C. also gave her an alternative perspective from the one she had had while in Alaska. This new framework taught Meghan that it is important to have diverse experiences. Hers have continued to shape her understanding of the work that goes into preserving the environment. Meghan plans on using this knowledge to defend policies that protect public lands. Center for Sustainable Communities maintained by Jon Jensen. Page last updated on 23 February 2018.